The NodeMCU 1.0 (ESP-12E Module) which has the Esp8266 wifi chip on board. The ESP32 DEV Module which has the Esp32 Wifi and bluetooth chip on board. In order to be able to communicate with the device using VoffCon, you will need to setup your computer so you can use it to send a program to the device. This program is called the Device server. The device server will allow the Node server to view and change values on the device it self. To get the device server onto the device you will need to follow the instructions below. If there is no file called config.json in the root of the Arduino project, then you will need to create it. After that you should provide a ssid and a ssid password. ssid is the name of your whifi network. the ssid is the password needed to connect to that network. These are the same values you need to connect your smart mobile phone to your wifi. These values will be used by the node server to create the program (the device server) which will be uploaded to your device. Click here, download the Arduino Software and install it. If you will be using the ESP32 Development Module you will need the ESP32 Arduino Core. The ESP32 is still fairly new so the Arduino IDE Board manager cannot be used, like with the ESP8266. Click here to get information on how get the ESP32 Arduino Core. Follow them to install the Core. 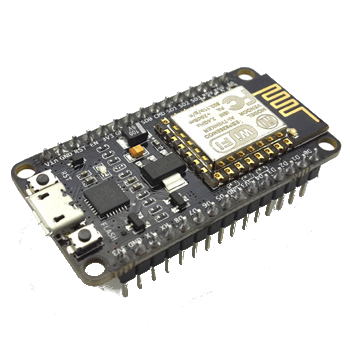 If you will be using the NodeMCU 1.0 (ESP-12E Module) you will need the ESP8266 Arduino Core. “Esp8266 by ESP8266 community” is the library I used to write the Device server. You will need to install it. Easiest way to do that is to use the Arduino IDE Board manager. type 82 into the text box to find the “esp8266 by ESP8266 Community” click it and press the “install” button. select from menu > Tools > Board: “Arduino/Genuino Uno” > NodeMCU 1.0 (ESP-12E Module). Now we should be able to send our device server program to the device via a usb port. Browse to the the VoffCon system. Create a device, by going to menu -> Devices -> Register a new device. Save the device, to add it to the VoffCon database. Press the “> Run” button and click the “Get program” button. Save the program to you local hard disk. for NodeMCU 1.0 select from menu > Tools > Board: “Arduino/Genuino Uno” > NodeMCU 1.0 (ESP-12E Module). Select the COM port the device is connected to. Select from the menu File -> New to create a new sketch. Open the .ino program you downloaded. Copy all text in the downloaded file and paste it into the new sketch in the arduino IDE. If VoffCon Node server has not automaticly changed the values below for you in the device server program, you will need to change them manually. IPV4_IPADDRESS  : (IP) Provide an ip address (IPV4) which you want the device to ask operating system for. PORT_NUMBER     : (Port) Provide the port number you want the device to listen and serve from. IPV4_GATEWAY    : (Default Gateway) The device needs to know the default gateway it will be using. IPV4_SUBNET     : (Subnet mask / netmask) The subnet mask it is on. WIFI_ACCESSPOINT: (SSID) Service set identifier of the wifi network the device will be connecting to. WIFI_PASSWORD   : (SSID password) The password to your wifi network. Compile, build and send the Device Server program to the device. Now the device has been setup and you should be able to connect to it. As noted above this program needs to be uploaded on the device you want to control from the node server. This server will only allow request to it, if the request comes from a client which is on the same subnet. In fact the Device server will check for the first 3 numbers in the calling ip address and if all 3 match the device ip address numbers then the caller will be considered as save and his requests will be acted upon. Exeptions to this can be made by whitelisting specific ip addresses. These are possible commands a client (the Node server) can send to the device. get returns the pin mappings of the device. That is f.example “D0” on the device is mapped to the pin number 16. Todo: make timed commands. That is allow a client to send a command which is a sequence of commands made to pins. That could be shomething like this. Set pins 1 value to 1023 and set pins 2 value to 0. Wait for 500 milliseconds and set pins 1 value to 0 and set pins 3 value to 256.
ps. If you want to develop the Device server further you can get documentation for the ESP8266 Community libraries.